More picture books to make you smile squint and ponder. Hello is a simple enough salutation, right. That opening phrase designed to introduce, calm, and unite two or more people. But what if those parties can’t speak the same language? Hello! is a visual and linguistic opportunity for primary aged children to meet 12 other Australian children with different cultural backgrounds and experience their different languages and customs. 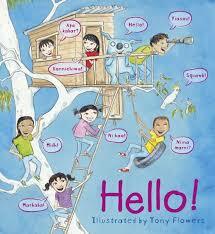 Many of them also speak English, which makes this introduction a breeze for readers and their carers to float through. 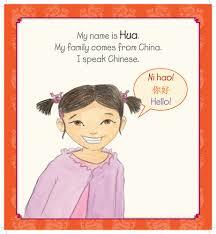 Each child introduces itself; Hua’s family for example comes from China. She speaks Chinese and then launches into the appropriate greetings, discusses some of her favourite foods and covers the numbers one to ten before signing off. These brief four page encounters encourage children to meet more and more people and practise more and more languages without feeling overwhelmed by the newness of it all. Not only are we treated to new words and their characters and or alphabets, but also Flowers’ bright illustrations which take us on a fun, colourful tour of cuisines, games and traditions. This is a glorious global version of Australia: Illustrated if you like (with emphasis on cultures most prevalent in Australia). Hello! is just as engaging and equally as useful. This is a curiously addictive collection of absurdly bright landscapes cleverly disguised as mazes that the reader must navigate in order to reach a game or destination. Each themed labyrinth provides enough detail and colour to entertain and overwhelm, ensuring a fun and worthwhile journey. 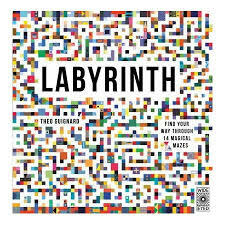 A combination of Where’s Wally and Find your Way favourites, Labyrinth, offers plenty to hold the attention of four to eight year-olds with minimal text encouraging a seek and find aspect, as well. Kaleidoscopic and kooky, it might send you crossed-eyed but it’s hours of fun. Fortunately, the correct paths are included in the end. Sensory detail is vital in most styles of writing. Without it, the readers’ capacity to fully immerse themselves into the story and really experience every emotion is greatly reduced. Picture books propose another quandary; how does one illustrate the smell of breakfast or the sound of birdcall without profuse descriptive narrative? Olivia’s Voice breaks the rules in this regard, allowing Lucas’ restrained yet beautiful text match Harrison’s sublime illustrations, and they do so all from the viewpoint of a deaf girl. Olivia’s world is visually rich and exquisitely detailed. In spite of an absence of one sense, nothing is overlooked and everything is shared. Even as Olivia describes what she cannot experience, a ‘trickling tap, blustery wind, dog snoring…’ reader’ senses are nourished and enriched. However, Olivia does have an ace up her sleeve and despite everything, shares her favourite moments and loves with us through her unique voice, the drums! 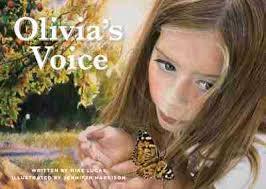 Succinct prose and gentle life-like illustrations ensure Olivia’s Voice is loud and true. This expressive and captivating picture book is a sensitive look at living with disabilities, redefining what is normal and what we can all access through our dreams. Suitable for children from the age of four and above. This is a one of those topics, a moment in history that would barely rate a raised eye brow (despite the incredible story) if you delivered it in plain words yet when portrayed as it is in Say Yes, with beautifully rendered drawings, authentic flavour and archival photographs and news clippings, it becomes a work of wonder and fascination. 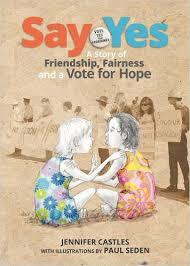 Say Yes celebrates the fiftieth anniversary of the historic landmark vote in the 1967 Referendum that allowed two laws to be changed forever affecting the Australian societal landscape. It is about two girls who grew up doing everything together and then couldn’t because of the law, because they looked different. I was excited to see Sedan’s illustrations in this memorable production where the only real colour distinction made between Mandy and her friend is in their dresses. Illustrations, solid panels of colour and actual photographs of the women who invited change, balance Castles’ linear text. The repeated use of the word, ‘yes’ serves to highlight the significance of the decision and the fact that nine out of ten Australians voted for change. Stirring and significant this book deserves to be in classrooms to encourage deeper exploration of that time.